This week’s party is over on Fairy and the Frog…so don’t miss your chance for parenting glory – pop on over there for the rules if you haven’t done if before. 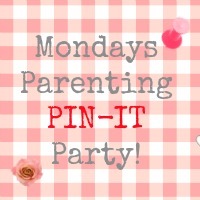 Our parenting party is open to each and everyone of you, every Monday – its a great way to find new blogs, get some ideas for entertaining the kids, and even see some wonderful new things on the picture-related Mecca that is the delightful Pinterest. If you have then add the post you want to include below!